In his discussion of visual style in Modern Painters Volume 3 (1856), John Ruskin (1819-1900) maintains that “he who is closest to Nature is best” and eschews all forms of artistic idealism in favour of a faithful attention to the “facts” of actuality as it confronts us. Yet, Ruskin argues, closeness to nature is not at all the same thing as the production of shallow visual resemblances to its external forms. What must be sought instead is that inner and deeper resemblance to which the “penetrative imagination” alone reaches, which is quite incompatible with techniques of superficial verisimilitude. The artist must therefore choose between these, and the best artists are those whose work draws the viewer’s own imagination directly into play as an active force. The painter, as it were, keys us more fully into reality through his representations, when he solicits our active imaginative participation in a project of making, transforming what is given to the senses in order to more fully fathom its intrinsic depths of meaning. It goes without saying that no artistic image can possibly show reality in all its fullness. But this, Ruskin suggests, is precisely a gain rather than a deficit. The artist selects and filters by what he presents for our consideration, guiding us in the direction of what really matters. “Reality” itself in its full-blown version, Ruskin argues, is too much for us to cope with, quickly taxing and overwhelming us with its plethora of undifferentiated detail. And, he says, the sort of “dangerous realism” which concentrates on a superficial “lifelikeness” tends to fail for the same reason, leaving the imagination languid and enervated rather than summoning it into a focused and directed activity. It is on these grounds that Ruskin favours the impressionistic style of William Turner over the more visually “accurate” depictions by John Constable. We need an editorial perspective on nature, Ruskin indicates. And if in ordinary empirical experience our own imagination gladly bears the responsibility for providing one, what a painting can do is stimulate us to imagine things differently, to experience the world through someone else’s eyes rather than our own. This is clearly “mimesis” of a sort, an art concerned first and foremost to faithfully reflect the truthfulness of a given world rather than substituting for it some other reality of its own making. Yet it is a form of mimesis which appreciates that the successful representation of reality necessarily involves its imaginative transformation and re-description, and thus, paradoxically, augments reality for us even as it offers faithful testimony to its contours. 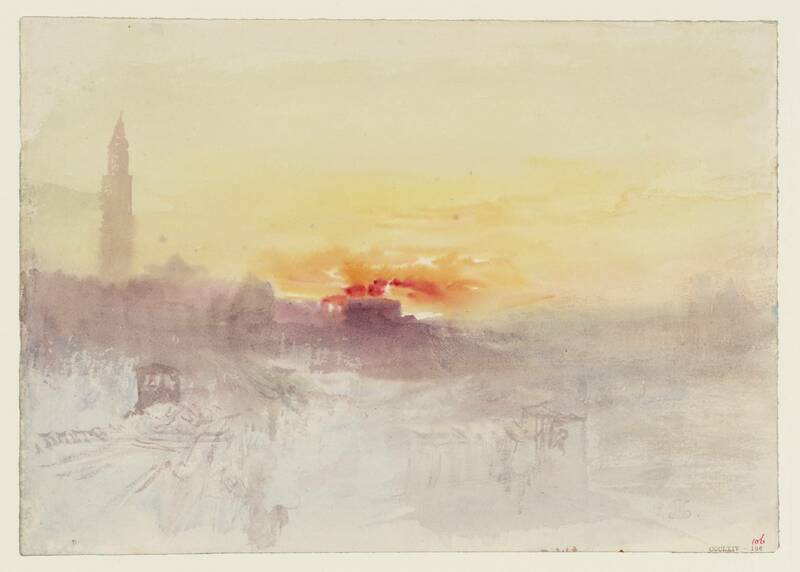 William Turner: Venice at Sunrise from the Hotel Europa with the Campanile of St Marco, ca. 1840, watercolour on paper, 198 x 280 mm. Tate Britain, London, England. 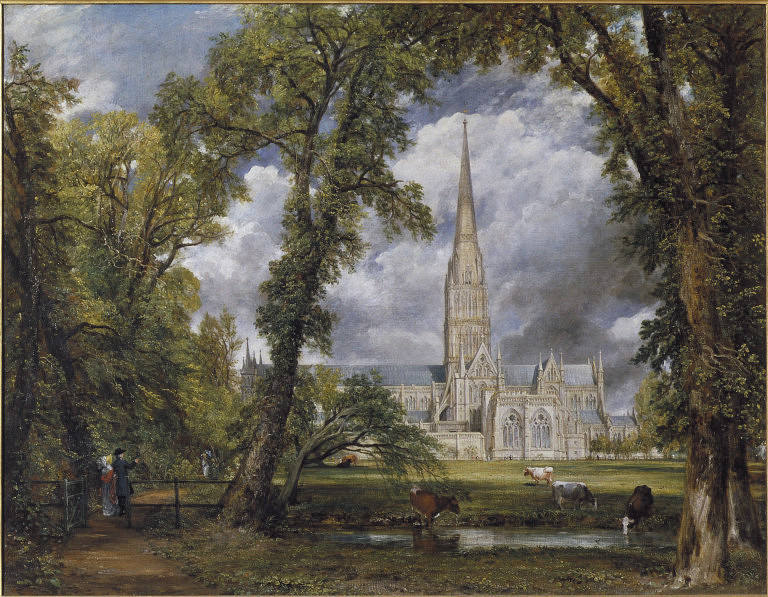 John Constable: Salisbury Cathedral from the Bishop’s Grounds, 1823, oil on canvas, 88 x 112 cm. Victoria and Albert Museum, London, England. Joseph Mallord William Turner (1775-1851) was an English Romantic landscape painter, watercolourist and printmaker, whose style can be said to have laid the foundation for Impressionism. Although Turner was considered a controversial figure in his day, he is now regarded as the artist who elevated landscape painting to an eminence rivalling history painting. His work was exhibited when he was still a teenager. His entire life was devoted to his art. Unlike many artists of his era, he was successful throughout his career. Turner's will, which was under litigation for many years, left more than 19,000 watercolors, drawings, and oils to the British nation. Most of these works are in the National Gallery and the Tate Gallery, London. John Constable (1776-1837) is famous for his landscapes, which are mostly of the Suffolk countryside, where he was born and lived. He made many open-air sketches, using these as a basis for his large exhibition paintings, which were worked up in the studio. His pictures are extremely popular today, but they were not particularly well received in England during his lifetime. He did, however, have considerable success in Paris. Constable was largely self-taught. In 1799 he was a probationer and in 1800 a student at the Royal Academy schools. He exhibited from 1802 at the Royal Academy in London and later at the Paris Salon. He was influenced by the Barbizon School, the French Romantic movement and Dutch artists such as Jacob van Ruisdael. Trevor Hart is Rector of Saint Andrew's Episcopal Church in St Andrews, Scotland. From 1995 to 2013 he was Professor of Divinity in the University of St Andrews and founding Director of the Institute for Theology, Imagination and the Arts there. He has lectured and published widely on Christian theology and the arts. His most recent book is Making Good: Creation, Creativity and Artistry (Baylor University Press, 2014).